Discover a town that believes in its citizens, schools and rural neighbors. Proclaiming, "Where Good Things Grow" as a town motto, it is no wonder this community has a family friendly and future oriented approach. With equal emphasis on historical preservation and economic growth, it is perfectly situated to continue being one of the most loved towns in the area. 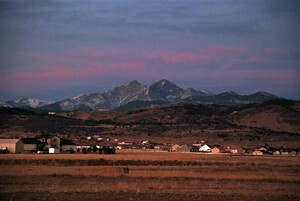 Berthoud is centrally located in the Northern Colorado Corridor. It is four miles west of I-25 on Hwy 56 (Exit 250). Offering a mix of rural and urban real estate, along with some great Victorian homes, this fantastic little town is full of new homes and condos for sale. It has beautiful tree lined streets and a great historic old town area offering and delivering a safe hometown feel. The town folk describe themselves as progressive and have over 5,000 residents proud to say they "love their small-town atmosphere and rich cultural and historic roots." With a low crime rate, abundant parks, open space and clean air, it is a great place to find a wonderful place to move in and live your dream life. A strong school system and a location between Loveland and Longmont offer citizens the advantages of small town living close to much entertainment, fun and the larger cities. Keep an eye on the trends in home sales in the area with our always-updated market report page here. Click on graph above for an interactive and custom market report for Berthoud. If you want to live in a Warm Home Town Environment close to the mountains and with neighbors that value the past but are heading towards the future then Berthoud is definitely one community you want to visit. We will be happy to give you a tour and show you some great homes that meet your parameters. If you would like more extensive information about homes and condos for sale in Berthoud or real estate in Loveland or Longmont please give us a call at 970-412-1657.